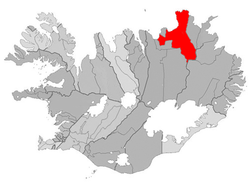 Raufarhöfn is a village located on the northeastern tip of the Melrakkaslétta peninsula in Iceland. 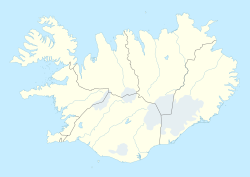 At one point in time, this small village was home to largest export harbor in Iceland. In the forties and fifties, the Herring frenzy dominated the Icelandic economy and Raufarhöfn was an important place in that economic chain. But after the herring disappeared the effect was devastating for the village. This is the reason for the old and interesting factory buildings. The village is the site of a modern monument called the "Arctic Henge" which is aligned to the heavens and is inspired by the mythical world of the Eddic poem Völuspá (Prophecy of the Seeress). As of 2019, it has 188 inhabitants. It was a major fish processing station during the large herring catches in the mid 20th century. The climate is tundra (Koppen: ET). As the northernmost community of mainland Iceland, Raufarhöfn is also the coldest with the annual average of 2.0 °C. ^ "Hit Iceland information page about Iceland"
^ Nemiroff, R.; Bonnell, J., eds. (2012-04-30). "Aurora Over Raufarhöfn". Astronomy Picture of the Day. NASA. Retrieved 30 April 2012. ^ The population of zipcode 675 sourced from https://www.statice.is/statistics/population/inhabitants/municipalities-and-urban-nuclei/ in March 2019. ^ a b "Climate data for Raufarhöfn". vedur.is. This page was last edited on 1 April 2019, at 16:57 (UTC).